Yeti Casino Do you believe in Sasquatch? Yeti is a mysterious creature. A missing link between ancient people and us. We know almost nothing about it, except for its love for slots, and casino games. This beast is hairy, muscular, and looks like a white Wookiee that shaved its palms, feet, and face. By the way, one of these creatures runs a casino of its own, and it’s cool! Yeti Casino UK has a bright and colorful website, filled with more than 500 online slots and games from top-notch providers, such as Microgaming, NetEnt, Amatic, and JFTW. There’s isn't a welcome bonus exactly for UK players, but a cashback refund bonus instead. For everybody else: 100% deposit match, up to €333, plus 77 extra free spins for Starburst or Joker Pro. The wagering requirements are 40xB, so the bonus is freaking great, but don’t forget to check the list of countries for which the bonus is eligible: it’s pretty short. Yeti Casino is an entertaining place where you can play your favorite slots and have lots of fun. If for some reason you won’t like this place, visit another decent website - Expekt Casino. Nice reputation among watchdog portals. The welcome offer is available only to several countries. They began operation in May 2017 and has already earned respect among players and review websites. There are a lot of advantages to discuss, but they will be described a bit later. For now, we suggest players check the list of restricted countries. It includes over 40 locations in total. That’s not the worst case ever, but still… The list consists of France, Italy, Czech Republic, Portugal, Spain, and some other countries. Take a closer look at the terms and conditions to explore the full list. Okay, and now it is time to begin our Yeti Casino review! First of all - Yeti Casino UK is operated by the reputable L&L Europe Group, which also runs top sites like All British and No Bonus. Regarding this, we should say that UK players can’t open more than one account across all L&L Europe casinos. It’s a pity, as all their casinos are cool. Secondly, they are licensed and regulated by the Malta Gaming Authority and the UK Gambling Commission, which are the most reputable authorities, when it comes to online casinos and their licenses. Thirdly, they boast an excellent reputation among other trustworthy watchdog portals - we, Holy Moly Casinos, found enough complimentary reviews. And, finally, it uses 256-Bit SSL encryption to protect your data from cybercriminals. You see, this website is entirely secure - you have nothing to worry about here. All casinos with a Blacklisted status should be avoided. For example, players shouldn’t even visit such websites as Golden Palace Casino. Players also shouldn’t consider the gambling websites with low ratings, such as Mansion Casino or 21Dukes Casino. Yeti Casino website is awesome, and Yeti itself is a cool guy we’d love to hang out with. Customer Support: Online support service is excellent. They have email, live chat, and phone, and they work 24 hours a day, 7 days a week. Chat operators are polite, have answers to all your questions, and don’t ask you stupid questions themselves. If you prefer solving your issues on your own, you can check the FAQ page - it is rather helpful. However, we guess, contacting the support agents via the online live chat is still the best way to get help. Banking: To make a deposit, you can choose Sofort, Visa, Mastercard, Skrill, Neteller, ecoPayz, Bitcoin, bank transfer or Paysafecard. When it comes to withdrawing the funds, you can choose between bank transfer, ecoPayz, Neteller, Skrill, and Visa. They state that all withdrawal requests are processed within 24 hours. Then, everything depends on your banking method. In any case, it won’t take you more than 5 days to get your money. The maximum amount you can withdraw per day is €5,000. This limit applies to local jackpots, but not to the pooled ones. If you request €2,300 or more, you will need to identify yourself during the first withdrawal. After your account is verified, you won’t have to go through this procedure again. The minimum withdrawal amount is €20. The minimum deposit amount is €10 (or €30 in case you use bank transfer), while the maximum limit depends on the deposit option. You can also set the deposit limits on your own. The casino displays a definite tendency, and the level of its popularity is continuously rising with a peak in July 2018. We are sure 2019 will continue this trend. If they add some unique promos for players, there will be a new highest level for sure. Check the graphic below to see everything with your own eyes. The online website of Yeti Casino UK looks excellent. It is hard to impress us, but this site is cool! Yeti is a generous host who introduces his website to you, offers you bonuses, and parties with classy girls and boys from the Live Games section. All the texts can be read without any problems - the colors are beautiful, so nothing will hurt your eyes here. All the pieces of information are easy to find, and they are always complete so that you won’t be interrogating customer support operators about obvious things. Apart from this, the site is available in five languages: English, German, Norwegian, Finnish, and Swedish. Wow. This Yeti is a very multilingual creature! The only thing is that the navigation in the lobby isn’t perfect, as there are no filters, only categories, and a search bar. Well, that’s still much better than nothing at all. We will describe the welcome bonus a bit later; now we would like to say a few words about the tournaments you can take part in. So, they hold weekly slot tournaments! Not all the games from the library are used - only some of them are eligible. The list of games is changing, so we are not going to provide it here, but you can find all the essential information on the casino’s website. Just check the Promotions page, and that’s it. The results of the tournaments can be found there as well. Oh, and one more thing - there are no promo codes for Yeti tournaments which you need to enter before you take part in the competition. Yeti Casino UK has more than 500 online games to offer, and the software providers are pretty decent: most slots are from Microgaming, NetEnt, and Amatic. Other games: Crown and Anchor, Pharaoh Bingo, Enchanted Woods, Super Bonus Bingo. This particular Yeti is tech-savvy, for sure, as he made his website accessible from all modern mobile devices, be it smartphones or tablets. Everything works smoothly and looks fine on mobile. You won’t need to waste your time on downloading and installing any apps - this Yeti is modern enough to be completely instant-play. A very good job for a wooly creature living somewhere in the snow-covered mountains. Or in the forest... with a mobile phone and Wi-Fi. Anyway, good job! In the Live Casino section, Yeti offers you to choose between Blackjack, Roulette, Baccarat, Caribbean Stud Poker, Casino Hold’em, Three Card Poker, and some other games. In total, there are over 50 live dealer games, which is more than enough. Are you ready for a huge first deposit bonus from Yeti? We are sure you are, as their online Welcome Bonus is one of the best in the industry. Usually, when you see a bonus more than €200 - you have to search for specific clauses in the terms and conditions that make it way worse than it looks. In this case, there are no tricky terms to make you suffer. The offer is a 100% match on your first deposit, up to €333, plus 77 free spins for slots Starburst or Joker Pro. And don’t forget about 23 free spins upon registration! There are no special Yeti bonus codes to use here, and you simply have to register and then to make your first deposit. The wagering requirements for the welcome bonus are 40 time the bonus amount, and they are nearly the fairest wagering requirement you can ever get! They must be met within 30 days, which is also fine. After you are done with the requirements, the bonus funds will be converted into cash, so you will be able to withdraw them or use for playing live dealer games. Winnings from the spins must also be wagered 40 times. Everything is amazing; the only thing is that this offer is available only to residents of Denmark, Finland, Norway, and several other countries. Yeti Casino’s Welcome Bonus is one of the best in the industry. In case you live in the UK, you can go for a different welcome offer. the standard welcome bonus is replaced with a 100% refund. This means that if you are not lucky with your first deposit, you will get a refund up to £111 as a bonus. The wagering requirements are 60 times the bonus amount. And again, there is no Yeti promo code to use here. Obviously, it is. It holds licenses from the Malta Gaming Authority and the UK Gambling Commission and boasts a nice reputation among other portals which we, Holy Moly Casinos, trust. It also uses SSL encryption technology to protect your data. So yes, it is absolutely safe and fair. Yes, you can. Just choose a game and start playing it. The only thing you have to remember is that this option is available only when you are not logged in. Sure, they are compatible with mobile devices, so you can play whenever and wherever you want. No, and this answer refers both to the desktop and mobile versions of this casino. To play the games, you need only your gadget and the Internet connection, and that’s it. Withdrawal time is pretty fast - it takes the casino 24 hours to process a request. When this stage is over, everything depends on your banking method. However, 5 days is the longest possible option. This is among one the best casinos that were launched in 2017 and probably near the top of all online casinos currently in operation. We, Holy Moly Casinos, the best detectives ever, didn’t even manage to find any Yeti complaints - this casino is just too good! It has some drawbacks; Yeti Casino withdrawal methods are lacking, but we’re sure that there will be more of them soon. Everything else is cool: the customer support service offers lots of options and works round-a clock, the games and slots are abundant and well-known, as well as the software providers. Their welcome bonus is huge and fair, but only available for a few countries, which is also not very good, so as usual, some players will be left out. 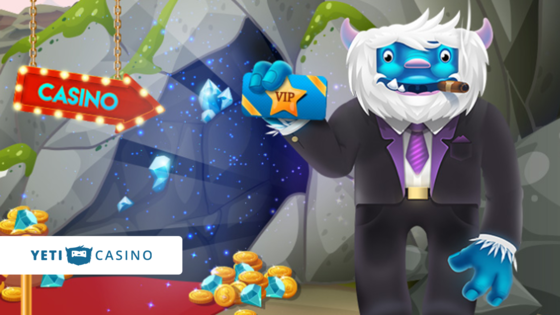 Click the button below to meet Yeti and spin some slots!